Do you want to enjoy special moments during the journey of Pregnancy? HomeRx Maternity Belt is designed to ease discomfort in back and abdomen during pregnancy. By providing the needed gentle support for waist and abdominal area, the maternity belt helps pregnant women who seek relief from hip and pelvic pains and other common stretching pains during pregnancy. The HomeRx Maternity Belt can provide that extra bit of support you need to relieve your discomfort and increase hip stability. Attention: HomeRx maternity belts are not intended to alleviate underlying medical issues. Please consult your doctor to make sure there are no medical issues that are wearing the pregnancy support belt may mask. 100% Satisfaction Guarantee! Our maternity belt is backed by our manufacturer 30 day money back guarantee. 擄ALL-DAY COMFORT IS JUST ONE CLICK AWAY - HomeRx pregnancy belt is designed to ease the discomfort of pregnancy by supporting your belly and reducing pressure on your lower back, while providing gentle compression on your abdominal area. EXPERIENCE THE JOYS OF PREGNANCY WITHOUT PAIN AND STRAIN! - Our new maternity brace helps relieve pain in the pelvic area and reduces lower back pressure during pregnancy. Reduce joint fatigue and muscle soreness! ‍ IDEAL FOR ANY SIZE BELLY BUMP - This elastic belly band provides maximum support throughout your entire pregnancy. The adjustable wraps fit perfectly for all sizes, whether your belly is petite or large.  PERFECT GIFT FOR FIRST TIME MOMS - Surprise a new mother with this gift item that will help ease the pains of pregnancy. A must have accessory for any new mommy. 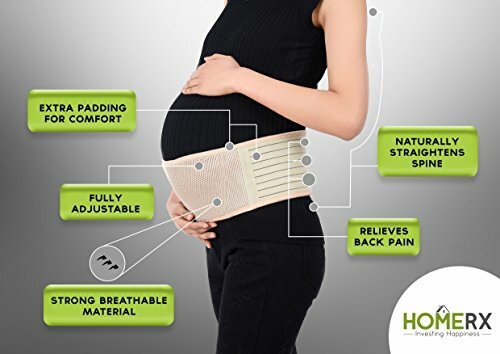  100% SATISFACTION GUARANTEE: Pregnancy support Maternity Belt by HomeRx is a quality product that is effective and has a long lasting result for users. The belt is easy to care with washable material and strong stick straps . BUY NOW! NO RISK 30 DAY 100% MONEY BACK GUARANTEE We take pride in outstanding customer service! If you have any questions about this product by Home Rx, contact us by completing and submitting the form below. If you are looking for a specif part number, please include it with your message.